There is nothing quite like the unique bond between a child and a grandparent. And right from the first reading of Celia and Nonna, this special love and warmth is felt with every word. Celia loves baking biscotti with her Nonna. She loves doing jigsaw puzzles and playing with felt at Nonna’s house. Most of all Celia loves sleepovers. But everything changes when Nonna has to move to a new home; ‘somewhere safe, where people can help out when she forgets things.’ Nonna’s new room is too small. It smells like lemons and vinegar. There’s no stove for baking biscotti and there’s only one bed. This uplifting story not only affectionately details the relationship between a young girl and her grandmother, but it addresses the challenge of life change. Rarely told in picture book form, Celia and Nonna tackles the harsh reality of aging grandparents. And it deals with it beautifully! As Celia comes to terms with her grandmother’s new environment, she learns to look for the positives and eventually embraces the change. 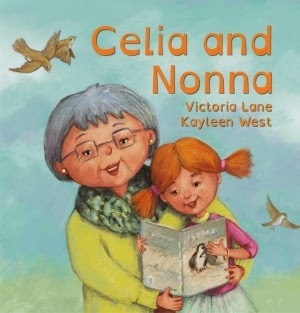 Celia and Nonna is a delightful read aloud story of love, family, memories, and reconnecting despite change. It is inspiring; helping young children navigate through what could be a confusing time as a grandparent grows older. A must read; offering a message of hope that even through change, some things never change. There are teachers' notes available for this book.